General Electric (GE), on many occasions, has been my reference and source of information on energy matters. It is due to GE's commitment to build innovative solutions to today’s environmental challenges that brings me to share with you this article on cheap and affordable solar power. Today, it is estimated that there are approximately 1.3 billion people who live without regular access to energy. People are forced to use fuels that pollute and cause respiratory illnesses, like kerosene and biomass, and spend long hours time collecting fuel. Ending energy poverty is about more than helping people see at night — it’s about economic opportunity, safer and healthier communities, better educational opportunities and connection to the rest of the world. Below is a look at a handful of the many organizations working to end energy poverty using solar power. 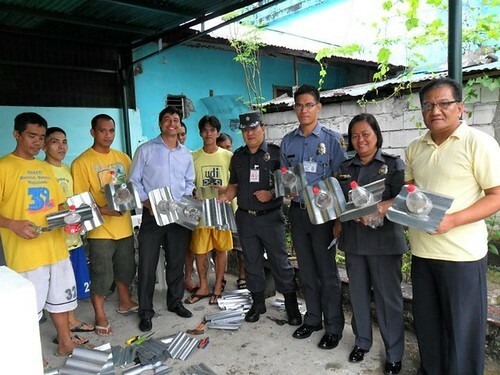 Isang Litrong Liwanag, or 1 Liter of Light, uses the Solar Bottle Light design – a cheap, sustainable, light bulb alternative – to light buildings during the day around the world. The Solar Bottle Light requires a one-liter plastic bottle, bleach, and a bottle-shaped hole in the roof. The plastic bottle is filled with a mixture of water, and bleach. It’s then capped, sealed, and placed in the hole halfway below and halfway above the roof. The water inside the bottle refracts and disperses sunlight, giving the bottle the power of a 50-60 watt light bulb. The design was pioneered by Alfredo Moser, a mechanic in Sao Paulo, who needed to light his workshop when his neighborhood suffered a long cut in electricity in 2002. Since then, students from MIT have worked with 1 Liter of Light to help develop the design further. SELF, a DC-based non-profit, grew out of an organization that sought to illuminate rural India in the 1990s. Since then, the company has installed solar electric systems in places including Benin, Lesotho, Burundi, Kenya and, most notably, Haiti, where the organization created systems that power 11 health care facilities and a hospital run by the NGO Partners In Health. Through this installation, the organization has improved the quality of medical services for over 170,000 Haitians by powering lights, microscopes, vaccine refrigerators and other lifesaving equipment with renewable energy. 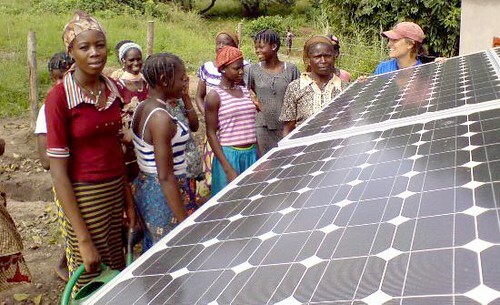 Solar Sister is a social enterprise committed to eradicating energy poverty by encouraging economic development. Solar Sister gives women entrepreneurs the opportunity to grow a sustainable business selling solar products. The organization reinvests any profits back into their network of entrepreneurs, creating a sustainable business with a positive impact on the environment and the community. WE CARE Solar is a non-profit organization that manufactures the Solar Suitcase, a portable solar system, for health clinics. 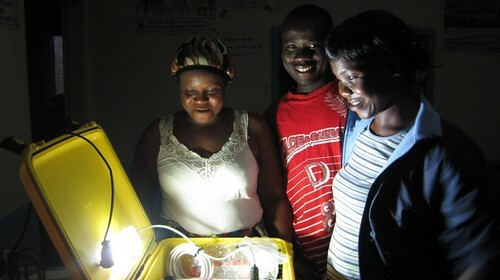 The Solar Suitcase is easy to use and is designed to be used at night when emergency health care is needed. The suitcase comes with highly efficient medical lighting, as well as power for mobile communication, computers, and medical devices. To date, the design has been used in almost 200 clinics in 17 countries, including Haiti, Mexico, Nicaragua, and South Sudan. To replace the highly polluting cooking stoves traditionally used in rural areas, Project Surya invented a stove that requires less than half as much biomass fuel, and emits less greenhouse gases. The improved stove has a solar lamp and a solar-panel powered fan to improve combustion. The project will help divert black carbon, methane, and ozone from the environment. In addition, because exposure to traditional biomass fuel can cause upper respiratory complications, low birth weight, eye diseases, and even blindness, replacing the stoves with clean technology is expected to improve public health. I cannot WAIT to read more of this. I mean, you just know so much about this. So much of it Ive never even thought of. You sure did put a new twist on something that Ive heard so much about. I don't believe Ive actually read anything that does this subject as good justice as you just did. Good knowledge! I am very happy to read this info.. It's very useful..
Solar-powered car in the future? Malaysians not ready to retire? 9.5 MW Mini Hydropower plants in Tuaran? Tablet PC market share: iPad rules.